Now that Mazda’s ‘Kodo’ design language and SkyActiv engineering principles have been given a thorough airing on the CX-5 and Mazda6, it’s time to pitch them at the volume end of the market. And that means coming up against the formidable – and somewhat entrenched – competition that is the Ford Focus and VW Golf. 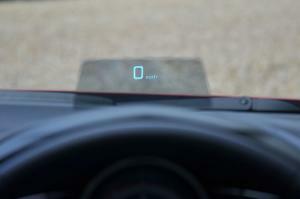 That’s no small task, and Mazda will have to pull something seriously compelling out of the bag if they are to make the in-roads they’re hoping for. Luckily, that’s just what they’ve done. 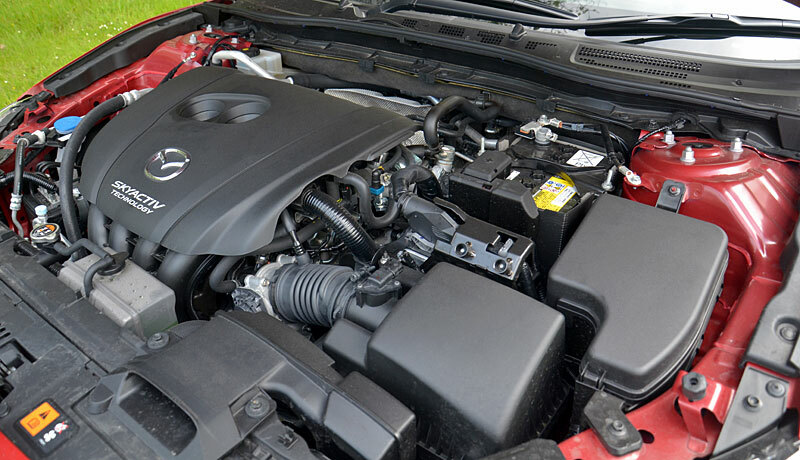 Although easily dismissed as nothing more than a marketing buzzword, behind the SkyActiv label lies a serious degree of engineering nouse. The body-shell is constructed from an unusually large proportion of high- and ultra-high-tensile steels, and this results in both low weight – good for economy and agility – and high strength, which aids both crash safety and driving feel. These principles continue through to the drive-train, where the engines use a light-weight design and a shared 14:1 compression ratio – unusually high for a petrol unit, and low for a diesel. In addition, a series of technologies bring further efficiency improvements, such as i-stop, the company’s stop/start system, and i-Eloop which recovers energy during braking and uses it to power the car’s electrical systems. 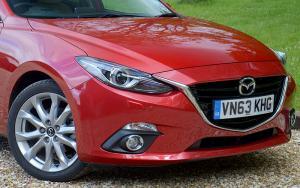 All of this is wrapped up in a handsome arrangement of swooping curves and sharp creases that culminate in the now familiar feline headlights and wing motif grille that features across much of the Mazda range. It’s a design that’s available in two different body shapes: a saloon-esque form dubbed ‘Fastback’ and this, the more conventional and potentially more popular five-door hatchback. It’s a shape that’s been styled with a deliberate rearward bias, and this allows for a more sporting silhouette as well as some clever interior packaging. 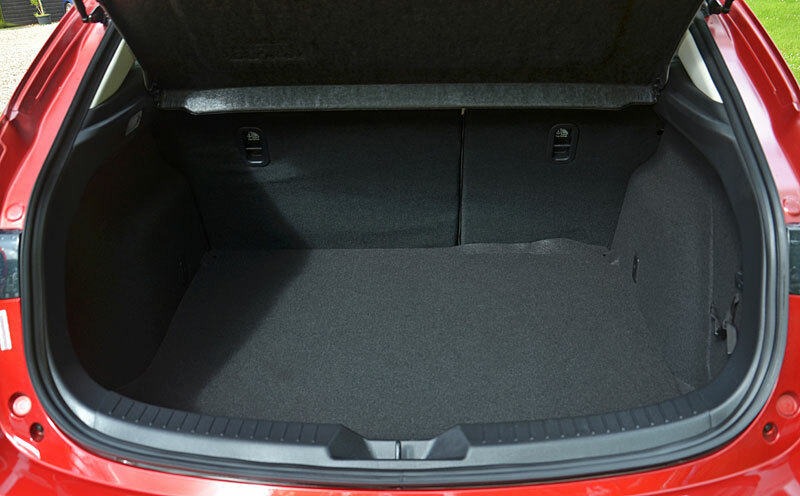 Despite the sloping roof-line, headroom for rear seat passengers is fine, although it’s a little tight for foot-room when initially climbing aboard. The seat backs fold forward easily, and doing so increases the hatchback’s 364 litre boot capacity to 1,263 litres. 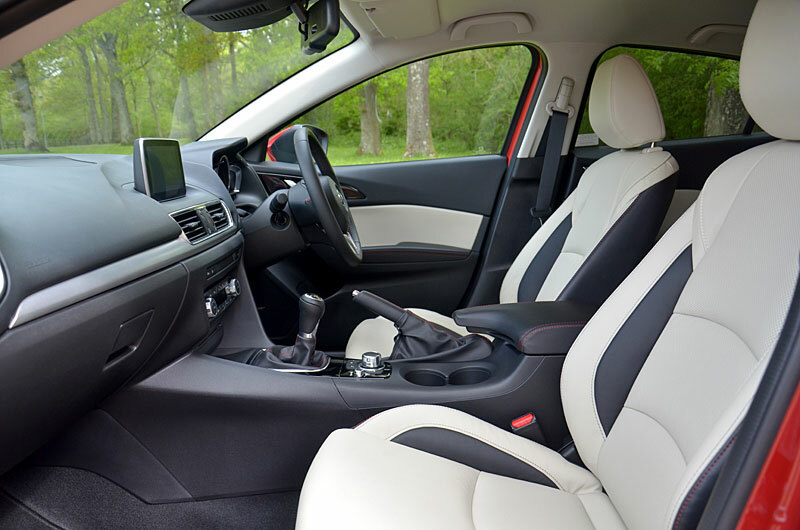 Up front, there’s a wide range of adjustment on offer from both seats and steering wheel, while the driver is cocooned by the high transmission tunnel and the wrap-around door panels. 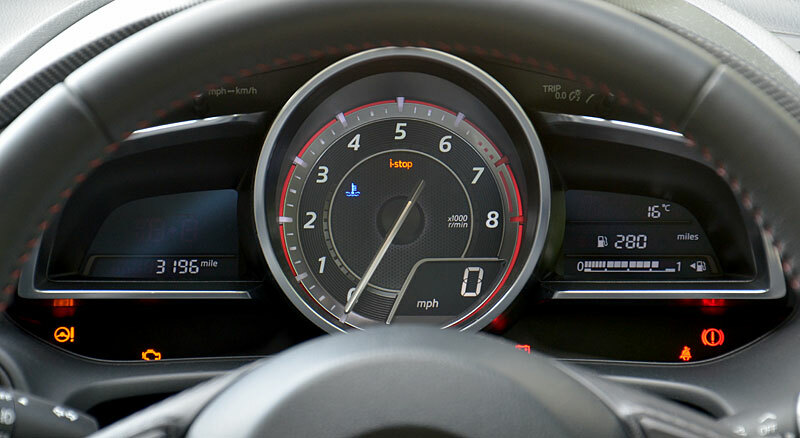 The instruments are arranged around a central rev counter with an inset digital speedo, the output from which is also echoed by a head-up display that rises from the top of the instrument binnacle. It’s surprisingly helpful, carrying not just speed but also navigation and other info when appropriate, and the advantage of projecting the display on to a separate panel is that its position can be adjusted to suit drivers of all sizes. The switchgear is all nicely weighted and well sited, the ventilation controls operating with a well-oiled satisfying action that’s echoed by the control wheel for the new media system. 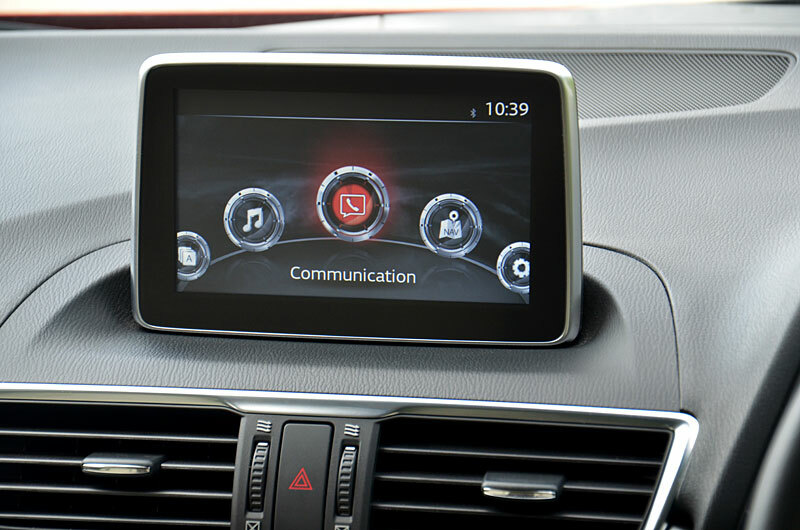 Co-developed with Harman, the system resides in an exceptionally high-resolution touch-screen perched on top of the dash. 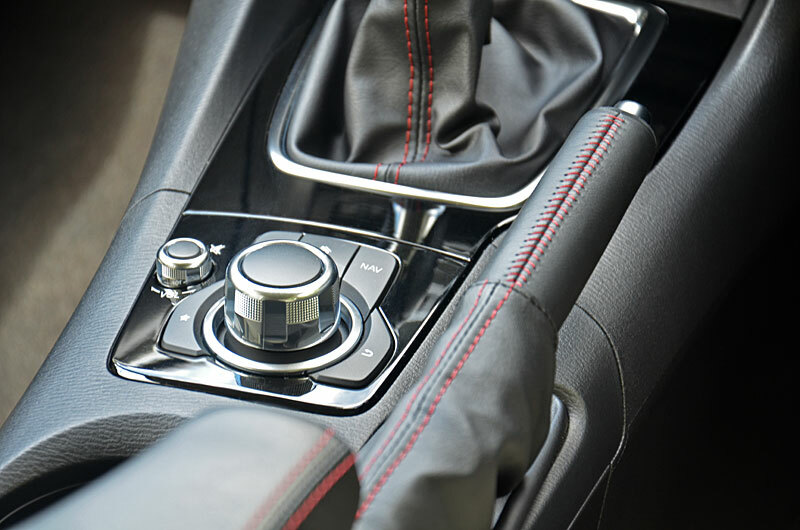 Using the control wheel mounted just behind the gear-lever, the driver can control the stereo, programme the optional navigation system, alter various vehicle settings and connect to their ‘phone via Bluetooth. Extending this further are a pair of Android and iOS apps that allow various internet radio and other services to be piped into the system. You can even have your friend’s latest Facebook and Twitter updates read out to you. If twisting and turning your way through the menus isn’t for you, you can instead use the voice command system or jab at the touch-screen, although frustratingly the touch element is disabled once on the move. 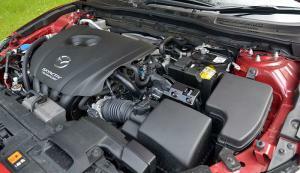 Providing the motive power are a range of four engines, starting with a 1.5-litre petrol unit with 100PS and progressing to a pair of 2.0-litres with 120PS and 165PS. The 1.5 is more cheerful to drive than its rather modest capacity might suggest, but the larger 2.0-litre units make more sense, boasting identical economy and emissions figures to its smaller brother yet with more power and torque. Pick of the bunch, though, is the excellent 2.2-litre twin-turbo diesel, its 150PS and 380Nm of torque making it not just the quickest with an 8.0-second 0-62mph time but also the most frugal, with the Fastback model recording an incredible 72.4mpg on the combined cycle (68.9mpg for the hatchback). CO2 emissions of 104 and 107 g/km for the Fastback and Hatchback respectively also make it the cheapest to tax, slotting firmly into VED Band B with an annual road tax bill of just £20. On the move, the diesel also exudes a rorty almost tuneful character to its engine bay activities, and whereas even the high-power petrol unit can feel a little lethargic at low revs, the diesel positively romps away and keeps on trucking well until the redline. Aiding and abetting this performance is the fabulously slick-shifting six-speed manual gearbox. 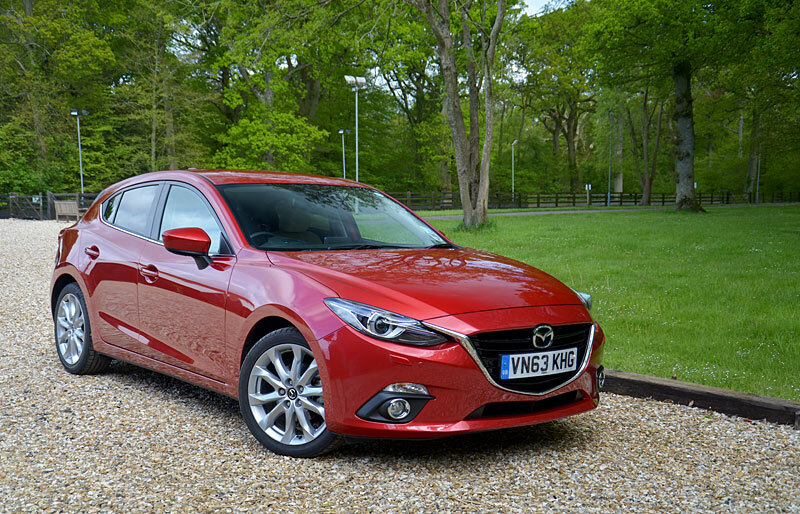 As we’ve come to expect from Mazda, it boasts a stubby gear-lever and a deliciously short throw that makes ratcheting your way through the ratios a real pleasure. The suspension displays a welcome suppleness that most German cars can only dream of, and the system seems to deal with large imperfections particularly well, smothering even speed-bumps into submission. Thankfully, this level of compliance doesn’t corrupt the handling, with the tight body control and responsive and linear steering lending the Mazda a feeling of genuine, well-sorted agility. In fact, our only criticism of the Mazda3’s road manners is that the larger 18-inch alloy wheels of the Sport model do introduce a touch more road-noise than we’d like. All models are well-equipped, although the mid-range SE-L model adds a useful raft of goodies including xenon headlights, automatic lights and wipers, climate control, privacy glass, parking sensors, heated seats and cruise control. The range-topping Sport grade goes on to add adaptive headlights, head-up display, nine-speaker Bose stereo, and keyless entry, plus satellite navigation that would otherwise be a £600 option on other models. Prices start at £16,695 for the 1.5-litre petrol, with the cheapest 2.0-litre model coming in at just £16,995. 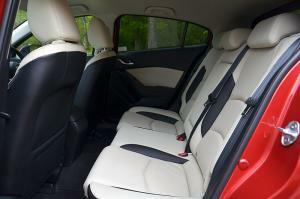 The diesel commands a £2,550 premium at £19,245, while the flagship Sport Nav diesel is yours for £22,145. Spec a Focus to the same level and you’ll be needing around £23,000 – do the same with a Golf, and you’ll be staring at a £28,000 price tag. 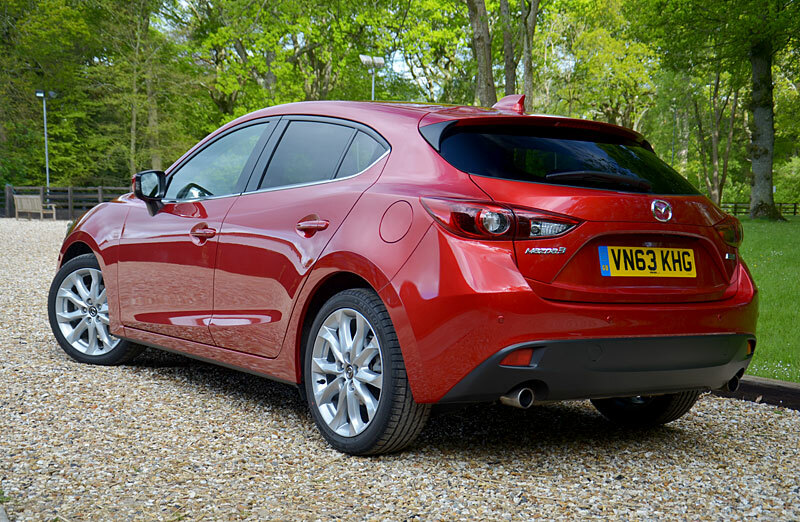 We’ve driven every model in the Mazda3 range and while we have our favourite – the Sport Nav diesel – there’s not a duff model amongst them. 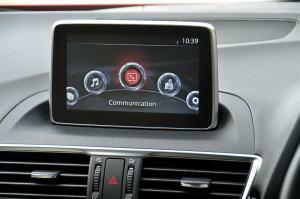 Every model in the range offers an engaging and wholesomely trustworthy driving experience. Even without the price advantage, if I had to choose between this, a Focus and a Golf, I’d choose the Mazda.